Thank you for your question. If you are having a problem with print quality, it can be due to dry ink within the print head. It may be worth running some print head cleans, or nozzle checks, which will dislodge any of the dry ink and should resolve the problem. I hope this helps. Please do not hesitate to contact us if you have any further queries. On some printers, if the genuine replacement cartridges aren't used there's no warning of low ink levels. Do the premium brand compatible Officejet Pro 8500 cartridges allow warnings or only the genuine ones? Thank you. As with most compatible cartridges, it's not always possible to gain a true ink level reading from the premium brand HP Officejet Pro 8500 All-in-One cartridges. The only real indication of the cartridge running out will be when your print quality starts to fade. At this point it would be advisable to organise your replacement. I need confirmation of the right ink for the printer above please. I need yellow and black or a value pack? Thanks. Can you tell me why this printer has printheads and ink cartridges and what do the printheads do please? Quite annoyed that I was stopped from buying a laser printer because of printheads and then wasn't told that the Officejet 8500 All-In-One printer requires printheads too! Targeting the business market, the HP Officejet Pro 8500 All-in-One is a definite must have for average-use businesses. It allows networking, wireless connectivity, and packs 4 different machines into one compact and easy to use device. This all-in-one boasts fast print speeds, high-volume capacity, and other exceptional functions, not to mention a wide range of connectivity options. 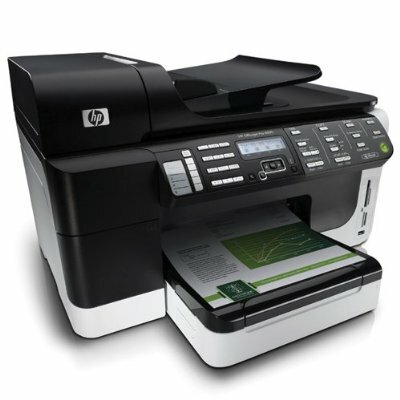 However, the HP Officejet Pro 8500 All-in-One does not have autodial fax buttons. Also, a dual paper input tray would have been useful. The HP Officejet Pro 8500 All-in-One has a relatively small footprint, measuring 13.03 inches high, 19.45 inches wide, and 18.86 inches deep. The addition of built in features like the auto-duplexer and auto document feeder make it a little bigger than previous models. The HP Officejet Pro 8500 All-in-One is also equipped with a 3.45 inch touch screen display and a scanner bay. There is an external card reader right at the bottom front of the machine's control panel, which supports Memory Stick, SD, Compact Flash, and xD. A PictBridge port is also at hand. The HP Officejet Pro 8500 All-in-One gives users a number of connectivity options – (1) through a network using the Ethernet port, (2) through a USB cord, and (3) through wireless networking. Set up is pretty simple and easy; just follow the onscreen instructions. Print quality is not compromised by the addition of other features, and print speeds are still impressive at 11.35ppm, although photos come out much slower. Undoubtedly packed with useful features, the HP Officejet Pro 8500 All-in-One still doesn't have autodial fax buttons and a dual paper tray. It does not have Bluetooth connectivity, but it does come with standard USB, Ethernet, and wireless interface.